Most clients never see what you’re getting to see here – me in my office! That may seem strange, but clients don’t get to come in here because there is too much confidential information that I’m working on. If you look closely, you can even see client files turned over so you can’t see the names! 1. Glass box on the front of the desk. It says “AMB” which is my granddad, Arthur Bitzer. You may have heard me talk about him because he had really great stories, and we’re a lot alike. He owned a Dodge dealership in Salem and used to keep this box on his desk. 2. Illini lamp. (Back left.) Many of you know by now I’m a proud Illini. I-L-L! 3. Dilbert calendar. To the right of my phone, you’ll see a Dilbert calendar, which my wife Michelle gives me every Christmas. 4. Homemade calendars. On the shelf above my head you’ll see two homemade calendars with family photos that Michelle made. 5. Grade school lunchbox. Top left on the top of the shelf you’ll see my post office lunch box that I took to school growing up in Taylorville. 6. 1982 World Series Coke bottle. On the top right side of the top of the bookshelf (right next to the Fred Bird bobblehead! ), you’ll see a 1982 Cardinals’ World Series Coke bottle. 7. 90-day goals. 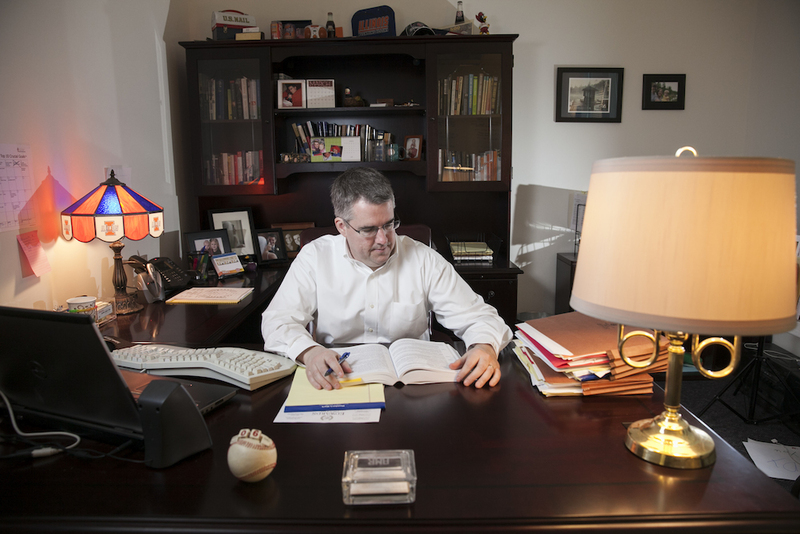 To the left of the Illini lamp on the wall, you’ll see my 90-day goals for the office. Four times a year I go to Orlando to meet with a business coach and 30 other estate planning attorneys from around the country. During that time we all share ideas and set goals for how we can better serve our clients. 8. Phone headset. Underneath the lamp is my phone headset. I use it when I’m on the phone so I can type or write notes. 9. Baseball calendar. On the front of the desk next to my grandfather’s glass box is my baseball calendar given to me by my brother, Jay, for Christmas years ago. 10. Glass of water. To the left of the Illini lamp, you’ll see my water with a brightly colored band around it. Bailey made this for me with her Rainbow Loom, which was all the rage in 1st grade. 11. Lamp. The lamp on the front of my desk has been with me since my first job out of law school with an Illinois Supreme Court judge in Peoria. The night before this picture was taken, the whole family made a special trip to Lowe’s to replace the old lampshade that was looking pretty ragged after being dropped over the years. 12. Photos from family vacation spot. On the wall on the back right are 2 photos taken in Waters, Michigan. The photo on the left was taken when I was 11 years old, at the dock house where we went every summer during my childhood. The photo on the right was taken in the same location in 2008 when our family went back to visit the area. 13. “I Love You” sign. On the bottom right of the photo on the floor there is a sign that Bailey made me. It says, “Daddy I Love You.” Bailey and Cole both love coming to my office, and I love having them here. Do you remember when Bailey made signs for all the office staff? Family, history, traditions, memories, humor and hard work. All of these things are the reason we do what we do on a daily basis. And they’re the reason we are driven to do it better than anyone else. Every family is special and unique. Every family deserves an effective plan to address and protect their unique needs. If you’d like to read more about our one-of-a-kind process, and how it protects our clients and their loved ones, click here. If you’d like to learn more in person, call 217-726-9200 to save a spot at one of our upcoming workshops. To learn more about our free workshop offerings, click here. Won’t my spouse automatically be able to make medical decisions if I’m in an accident? No. Just because you’re married doesn’t mean your spouse has all the rights to deal with your care and medical choices. In emergency situations, a spouse might be able to act, but any ongoing medical situation will require more legal authority. That authority either needs to be through a power of attorney or else a court guardianship order. And that HIPAA medical release you may have signed at the doctor’s office will not allow you to make decisions, even if it allows you to get information. What you need is a healthcare power of attorney that allows you to BOTH get information AND make decisions for your spouse. Can’t my spouse manage our finances without a power of attorney? Not necessarily. A spouse can access joint bank accounts, but other types of assets may be a problem. For example, if a car is in your spouse’s name, you would not be able to transfer it if the spouse is disabled. What if you need to sell your house? Even though the house is jointly owned you will need BOTH spouses’ signatures on the deed to sell it. What if the spouse can’t sign? That’s when a power of attorney will allow you to sign for your spouse. Why do I need a power of attorney for my college age child? Once a child turns 18 and goes away to college, you can no longer make decisions for him or her. So what types of issues might arise that would require you have a POA for them to act on their behalf? Illness or accidents: again, if your child is over the age of 18 and is in an accident, just because you’re their parent does not entitle you to find out what’s happening medically. Imagine your child needs emergency surgery and is 8 hours from home. The doctors are not required, and in fact are prohibited, from speaking with you without your child’s approval. After a tragic accident, as the parent, you would not be able to help pay bills or deal with your child’s bank accounts without some legal authority like a power of attorney. Does an attorney have to draft the POA? No, an attorney is not legally required to do the form. And the forms are available other places. But if you work with us, we provide advice about HOW to fill out the form. We deal with these issues every single day. It’s ALL we do. Because of that, we think about all sides of an issue, what potential pitfalls might be and guide you through what’s best for your unique situation – that’s why I’m sometimes called a “Counselor-at-law.” I give valuable counsel that can prevent heartache and wasted money. Can’t the person I named as executor in my will just do it? No! An executor has NO authority to act on your behalf before your death. Just because they have been named as someone to make decisions AFTER your death does not mean that hospitals, doctors, banks and/or the courts will recognize them as such while you are still living. Your death changes the authority that people can use. Before you die, it’s the power of attorney. After you die, it’s the executor. As always, we’re just a phone call away. If, after reading about POAs, you’ve decided it’s time to do something about this important issue, give us a call. We will talk with you about the specifics of your situation and what the best next step might be. Give us a call at 217-726-9200. A few months ago I went to my nephew’s middle school for the career fair. I talked to 5 different groups of students about how I am the “other” kind of attorney. Most people, when they think of lawyers, think of the lawyers they see on TV — always in court suing people or defending criminals. I told the kids those attorneys are what we call litigation attorneys. And I’m not that kind. I asked the students, “What other kinds of attorneys are there?” All I got were blank looks. But yes, there is another kind! Some people call them “transactional” attorneys. These are the ones who deal with Wills, Trusts, estates, nursing home planning, contracts, real estate and business. This is the type of thing we do here at Edwards Group, so you won’t usually see me in a suit and tie. I don’t go to court very often. 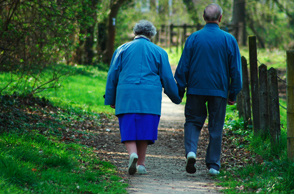 How do you keep life savings from being depleted by nursing home costs? Read our Nursing Home Crisis Plan Case Study to find out one of the ways we helped a client. Mary recently had a stroke and will have to be placed in a nursing facility. She doesn’t want nursing home care to drain all of her savings. Edwards Group worked to maximize Medicaid benefits as quickly as possible, created a trust to preserve assets, pre-paid funeral costs and preserved more than 50% of Mary’s assets. Total Savings to Mary and her family: more than $100,000. What do sweaters in the suitcase have to do with estate planning? Let me tell you. As I sit down with clients to review the draft of their living trust, they may think the trust is much thicker than they expected. Before we review the trust, I tell them a story. I’m terrible at packing for trips. I pack way too much. I always think I need everything – all kinds of extra clothes, books, all kinds of stuff. Of course, with each trip out of town, I don’t use half the stuff I take. So, what happens when I take the next trip? Same thing. I still pack way too much because, you know, I just might need it. Doesn’t matter that I usually don’t need all that because this next trip I just MIGHT need it! What does this have to do with a living trust document? As we look through the trust documents, there are various paragraphs, pages, even entire sections that are “extra sweaters in the suitcase”. It’s there if we need it, even if we probably won’t need it. Since our estate planning clients don’t pay us by the word or by the page or even by the hour (they pay flat fees), then we make sure our living trust documents have all the “extra sweaters” that may be needed in the future to carry out their plan. Want an example of an “extra sweater” in the trust? Well, we have an entire section that talks about what happens if we can’t find a beneficiary. If we leave money to a long lost cousin and don’t know where the cousin is when it’s time to distribute, we have a process laid out clearly in the document so it doesn’t hold up the rest of the trust plan. That’s just one example of the various “extra sweaters” we include in our legal documents to better protect our clients and their families. Estate Planning: What’s in your tool box? Is this the first question that your contractor asks you when you decide to hire him to build a house? Or, if you’re car stops running and you take it to the mechanic to be fixed, do you quiz him on which tools he plans to use in repairing it? When you need surgery to save your life, do you make sure you learn all about the different scalpels and various medical instruments to be used by the doctor? No? You don’t focus on those things? Well, then why do people focus more on the estate planning tools than on what they want to accomplish with their plan? Wills, Living Trusts, Powers of Attorney, various other planning or tax strategies. All of these are just tools. Tools in the tool box of an estate planning attorney who is there to help you build the kind of plan you want. If the plan looks and does what you want, then does it really matter what tools were used to get there? The division of labor is much clearer in some of the other professions – doctor, contractor, mechanic, etc. But with law, it seems that attorneys have fed the confusion by hyping and selling certain “tools” instead of promoting their process of helping clients build a plan that works for them. Sure, some clients want to understand the tools, and that’s fine. But, remember, the tools are not what’s important. What is important? Having your wishes, goals, and dreams carried out, in a way that allows your wisdom and values to be communicated as well. My clients are already the experts on what they need to know. They know their families, values, what’s important to them. I am the mechanic with the tool box, and I can use whatever tools are necessary to help you carry out your plan. So, if you want to work with me on your planning, please keep in mind that we want to focus our energy on the house we are building, not what kind of hammer is being used to build it. http://edwardsgroupllc.com/wp-content/uploads/2014/02/USE-Logo-estate-planning-280x100.png 0 0 David http://edwardsgroupllc.com/wp-content/uploads/2014/02/USE-Logo-estate-planning-280x100.png David2009-06-24 06:55:002017-02-07 19:46:55Estate Planning: What's in your tool box? Do nothing. Let others sort it out later. Do it yourself. Get a form and fill in the blanks. How hard can it be? Use a document-driven attorney. Pay lots of money for a fancier form that someone else fills out for you. Use a counseling-oriented attorney. Build a lifelong relationship with someone you can trust… someone who also knows your other family members, understands your family values and collaborates with your other advisors (tax, financial, banking, insurance). Work with this person over time to create a personalized plan that is always up to date. Experience peace of mind knowing you’ve done everything within your power to protect your loved ones and the things for which you’ve worked so hard. So, am I your type? http://edwardsgroupllc.com/wp-content/uploads/2014/02/USE-Logo-estate-planning-280x100.png 0 0 David http://edwardsgroupllc.com/wp-content/uploads/2014/02/USE-Logo-estate-planning-280x100.png David2009-04-23 10:50:002009-04-23 10:50:00Am I Your Type?